Dedication: To the beloved people of God who, at this present time, have forgotten prosperity and whose souls are removed afar off from peace. To those whose hearts cry out even now, “My strength and my hope is perished from the Lord.” Whose remembrance is of their affliction, misery, wormwood and gall of present circumstances, and their hearts humbled within them. May this message put you in remembrance of, and establish you in, the gracious truth that, “It is of the LORD’S mercies that we are not consumed, because His compassions fail not. They are new every morning” great is thy faithfulness.”(Lamentations 3:22-23) May the faithful God make you to soon hope and quietly wait for the salvation of the Lord. The testimony of the writers of the Scriptures in both the Old and New Testaments abound with a single theme: the faithfulness of God. No time is wasted in dwelling on the unfaithfulness of man, for every believer is well aware of the deceitful and desperately wicked heart within; and when walking under its influence and dragging its heavy chains of unbelief, his only hope is in the faithfulness of God. We are often defeated by a morbid introspection of the heart and mourning over our unbelief, our failure and sin, when the source of victory is not to be found in our hope of perfect obedience, but in the perfect faithfulness of God to us. We seem to forget that if we should succeed in doing all those things commanded us, an honest heart would still force us to say, “We are unprofitable servants…”. Therefore, this message will be of no profit to those who are satisfied with their own steadfastness and fascinated with their own faithfulness; but it will gender hope to the soul who languishes in his lethargy and will, by the grace of God, move him to worship and praise the faithful God who keeps him in all his ways. When the heart is painfully aware of its own unworthiness and filled with doubt that God will hear and undertake in its deepest trial, doctrine cannot afford the heart the rest it desires and longs for. This is the time for testimony. Testimony of past experiences, when time after time God brought delivering grace into the midst of impossible circumstances in our lives. It was the remembrance of God’s great faithfulness that brought courage to the heart of Jeremiah when his strength and hope had perished from the Lord. It was the constant rehearsal of God’s past faithfulness to Israel that caused the Psalmist to walk once more in the light of His countenance. Joseph must have often thought his troubles were unbearable, when first he was rejected of his brethren, put in the place of death in the pit, sold into slavery in a strange land far away from home and loved ones, only to be falsely accused by his employer’s wife and cast into prison as a common criminal. How heavy his chains were, and how much heavier must his heart have been, as he sat in the gloom of that prison with not a hope for the future. But witness the faithfulness of ‘God in the life of Joseph. It was his contact with the butler, made while in prison, that placed him on the throne of Egypt and eventually restored him to the arms of his father and brethren. Jacob surely must have considered his cup too bitter to drink, when the bloody garment of his beloved son was offered as mute evidence of Joseph’s tragic death. The scriptures record how he refused to be comforted and vowed to go down to his grave in mourning for his son, as he rent his clothes, put sackcloth upon his loins and bitterly wept under a temptation that had taken him, that was more than he could bear. No escape was to be seen in the sore famine that next came into his land and threatened his life and the lives of his sons. In desperation he sent his sons into Egypt to buy corn, only to have his sorrows multiplied by Simeon’s imprisonment and the demand for Benjamin to be brought to Egypt. Jacob wept that he would be brought gray haired to his grave with sorrow. It was not until the daybreak of Jacob’s long night of trouble that the shadows fled away and he saw that the hand of his faithful God had overruled it all for His glory and Jacob’s good. In all of his sufferings, God was faithfully bringing Jacob to the glorified Son on the throne, who was the source of all nourishment and life. Oh, dear reader, hear now this testimony of God’s faithfulness, and know that if the cup of your suffering seems to be more than you can bear at this moment, it is because God is driving you to the blessed Son on His throne, who wants to nourish you and give you of His life. Think of the great weight of sin that was lifted from your heart, when you came to the Lord Jesus Christ for salvation. All of the years that the locust and the cankerworm had eaten were restored by the faithfulness of God in the blood of the everlasting covenant. Your sins, that were once scarlet, were made white as snow, and though they were red like crimson, they were made as wool. All were cast behind His back, carried as far as east is from west from His presence never to be remembered against you again. This is the time to trust”. But, what if the heart can’t trust? What if the heart is filled with unbelief and the promises of God seem empty and meaningless? What if we cannot find it in our poor wretched hearts to believe God, claim His promise and rest in His faithfulness? What then? Who shall deliver us? Thank God, He will! May I share with you this personal experience? A few years ago, during a serious illness, I passed through some troubled waters that were new to me. For the first time in my Christian experience, I could not pray, for no words came and worst of all, there seemed to be no desire in my heart toward God. I tried to read God’s Word and the promises were empty and there seemed to be not a word of personal hope for me. My wife could not comfort me, the counsel of brethren was meaningless, and I felt myself slipping lower and lower into a bottomless pit of spiritual despondency. For days I was sure that this was the end of my ministry. I was sure that I could never teach or preach again. To add to my sorrow, my wicked heart convinced me that if I couldn’t pray, read God’s Word, teach or preach, then my blessing, joy and fellowship in the Lord would be denied me. I cannot explain to you how He did it; but in spite of this cesspool of unbelief, He restored my soul, comforted me with His rod and staff, anointed my head with oil until my cup ran over, for the faithful Shepherd could not deny Himself. 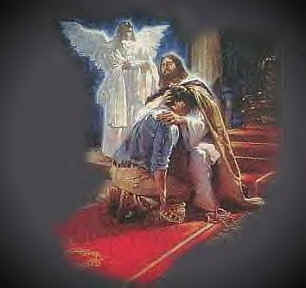 Had He not promised me: “I will never leave thee, nor forsake thee”? Now, here the testimony of His Word on this subject. Israel murmured in unbelief against the Lord. Certain that the Lord meant to kill them in the wilderness, they would have gladly returned to Egypt if they could have found a leader. But, the faithful God, who could not deny Himself, rained manna from heaven every morning, and brought water from the flinty rock, watched over them at night by a pillar of fire, and led them by day in the cloud. He destroyed their enemies, bore them up on eagle’s wings, and brought them unto Himself, and all of it in spite of their unbelief. Read the thrilling story of the Emmaus disciples. Here were two disciples who could not find it in their hearts to believe the Word of God. Jesus called them “fools and slow of heart” because of their unbelief. See them going down the road of life sad, trying comfort one another, not conscious of the Lord’s presence, and wrongly accusing Him of being a stranger to their problems, and ignorant of the things that so burdened them. If restored fellowship depends upon their faithfulness, they are destined to walk the lonely road to Emmaus forever without the joy of His presence; but the faithful Shepherd, who cannot deny Himself, meets them in their need and in their unbelief; He ministers the precious Word of God until faith is kindled anew, and they are brought into new communion with Jesus in the breaking of bread. See them now! With eyes opened that they might know Him, and hearts burning within, they rise up the same hour and go out to tell others that they have seen Him and that He has made Himself known to them. They had not prayed, read the Word, nor confessed their sins; but the faithful God, who called them into the fellowship of His Son Jesus Christ, delivered them from the blindness of unbelief by the faithful ministry of the Lord Jesus in their lives. Were it not for this in our times of doubt and unbelief, we would never trust Him again. We often testify to the deliverance of God in our lives in response to our prayers. I often wonder if God is really glorified, or our faith instead? It is true, thank God, that He has often heard my supplication and answered out of heaven in response to my cry for help; but it is also true, bless God, that He has more often answered in response to my unbelief. 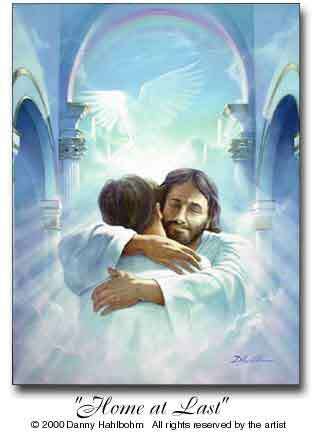 When I could not cry, He has answered. When I could not believe, He has been faithful. Let me show this principle from the scriptures. 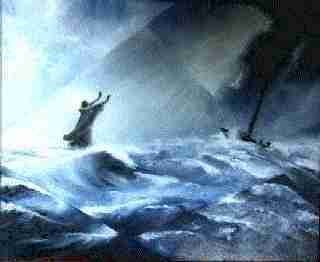 In Mark 4:35-41, we have the account of the storm that endangered the ship in which the disciples and the Lord Jesus were sailing. The original text hints at a hurricane that arose; the waves beat against the ship and soon began to fill it with water. The disciples, seeing this danger, awakened the Lord Jesus, who had been sleeping on a pillow, to accuse Him of not caring whether they perish or not. What bitter, black unbelief! Had not His word been, “Let us pass over unto the other side”? Here, under the spell of unbelief, these disciples are afraid, not aware of His presence with them, and boldly slandering His love for them by accusing Him of caring not whether they or die. Dear reader, you and I have done as much against the blessed Lord and, thank God, He has done as much for us as He did for them. I call your attention to the fact that He was awakened and stirred to undertake for them in response, not to their prayer of faith, but to their cry of unbelief!! He plainly said they had no faith and were fearful, yet He delivered them by rebuking the hurricane, muzzling the sea, bringing a great calm into their hearts and lives, and demonstrating for us His faithfulness in meeting the unbelief of our hearts with His grace. My heart has been blessed by the story, in John 21, of the unsuccessful night of fishing engaged in by Peter and six others, including John. The original language of this account leads us to believe that their intention was to desert the Lord and return to the fishing business permanently. Only a few days away from Calvary and here they were, ready to return to the old life in unbelief and discouragement. They went fishing in the flesh and accomplished just what the flesh can accomplish … nothing! As they approached the shore the next morning, an apparent stranger directed them to cast their net on the right side of the ship. They did and were not able to draw it for the multitude of fishes. They soon recognized the Lord and came to shore to find … what? Jesus, ready to deny them of their needs in punishment for their unbelief and disobedience? No, miracle of grace that it was, they found a fire of coals to warm them in their coldness … the dear Lord Jesus fixing breakfast to meet their hunger and standing ready with His fellowship to restore their wayward hearts!! “Come and dine,” the faithful God cries, and withholds not a single blessing from His erring children, for He is faithful and cannot deny Himself. Only eternity will fully tell this blessed story; for, when we are come to Zion’s shore to meet the Lord Jesus in the morning, we will not only find that He waits to warm us, feed us, and to fellowship with us forever, but like the disciples of old, we will also find that we have brought fruit with us that we did not catch ourselves, but was placed in our nets by the faithful hand of the Shepherd. With Peter, we will be forced to say, “Lord, thou knowest that I love thee”!